When is my MASEP class? Where is my MASEP class? When should I enroll in MASEP? I was told I did not need to take MASEP, is that correct? According to Mississippi Law, if an individual is convicted or non-adjucated of 1st offense DUI, he/she is required to attend and complete MASEP. If the court chooses, they may find the individual in contempt of court for not attending MASEP. With regard to license reinstatement, if an individual does not attend MASEP for a 1st offense DUI, their license will not be eligible for reinstatement until they have completed MASEP. Will my license suspension be reduced if I complete MASEP? Yes. For a 1st offense DUI, an individual’s license suspension can be reduced to 90 days (with MASEP completion) as long as he/she was not charged with any additional charges that may affect the suspension time. The individual must contact Driver Improvement for specific details regarding his/her license suspension. Be prepared to give your driver’s license number when calling Driver Improvement at (601) 987-1224. Do I need to take MASEP even if I do not have a driver’s license? Yes. Every individual who receives a 1st offense DUI in Mississippi is required to complete MASEP. For individuals that have never had a driver’s license, they will be required to complete MASEP in order to obtain a Mississippi driver’s license. What do I do to get my license back when I complete MASEP? If the individual is licensed with Mississippi, they will need a copy of his/her MASEP certificate, proof of liability insurance and the $175 reinstatement fee. If the individual is licensed with another state, he/she must contact the licensing agency in the state he/she is licensed for instructions on how to reinstate his/her license. What do I do if I cannot attend MASEP when I am scheduled to attend? The individual must contact the court that ordered him/her to attend MASEP to verify that it is okay to attend MASEP at a later date. No. You must pay the fee by check or debit/credit card at the first session. Can I enroll in the MASEP class in a different location than where I was ordered to attend? Yes. The individual should contact the MASEP office for the other locations address and time. 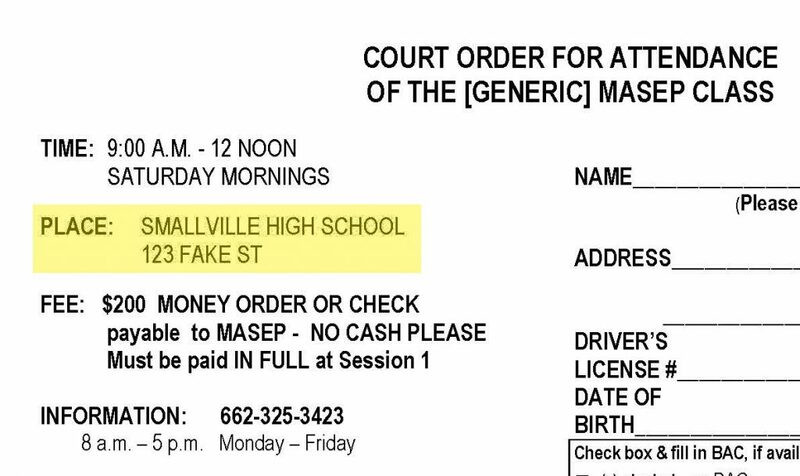 He/She will take the court order they were initially given to the MASEP location they are changing to at the scheduled time. Once enrolled, all sessions must be completed at the same location. The MASEP office may be reached at 662-325-3423. Can I get a replacement copy of my certificate? Yes. You will need to contact the MASEP office (by phone at 662-325-3423, e-mail at masep@ssrc.msstate.edu, or fax at (662) 325-9439) and request a copy of your certificate. Be prepared to give your name and driver’s license number. A copy of his/her certificate will be mailed to the address given. There is a $25 fee which can be paid by money order or credit card. What do I do if I lost my court order or if the court never gave me a court order? The individual must contact the court that ordered him/her to attend MASEP to obtain a copy of their original court order. You must bring your MASEP court order with you to the first session. I received a letter from the Driver Improvement Branch. What do I do with this letter? The letter is sent from the Driver Improvement Branch of the Department of Public Safety to inform the individual that his/her license has been suspended and that they will need to attend MASEP to reduce their suspension time. If the individual has other specific questions, he/she should contact the Department of Public Safety at (601) 987-1224. What do I do if I lost my homework booklet? Completed homework is required for each session. He/she should contact the MASEP office at 662-325-3423 and request the needed homework booklet. Be prepared to pay a $10.00 fee by money order or credit card. What do I do if I cannot make it to one of my sessions? The individual can wait until the next time the missed session is available. Once you enroll, you have a year to complete and all sessions must be taken in order. Can I bring a guest with me to MASEP class? No. An individual is not allowed to bring a guest with him/her to the MASEP classroom. Can I bring an interpreter with me to class? For an individual who cannot speak English, MASEP has all class handouts translated into Spanish. For a hearing impaired individual, he/she will need to have someone contact the MASEP office at 662-325-3423 so that a certified interpreter can be obtained for the dates needed. I received a letter from MASEP stating that I failed to enroll and may be held in contempt of court. What do I do? An individual receives this letter if he/she does not enroll in MASEP as he/she was scheduled by the court. This letter is more of a reminder for the individual and gives the next available dates for attending MASEP. The individual should contact his/her court with his/her plans for attending MASEP since the court may hold them in contempt for failure to attend as scheduled by the MASEP court order. Can I take a class in another state if I got my DUI in Mississippi? If you live, work, or go to school in another state, you should contact the MASEP office at 662-325-3423 and REQUEST APPROVAL to take an out of state class. There will be a $50 out of State Processing Fee if you take a class in a different state. If you live in Mississippi, you must complete MASEP in Mississippi. What do I do once I complete a class in another state? 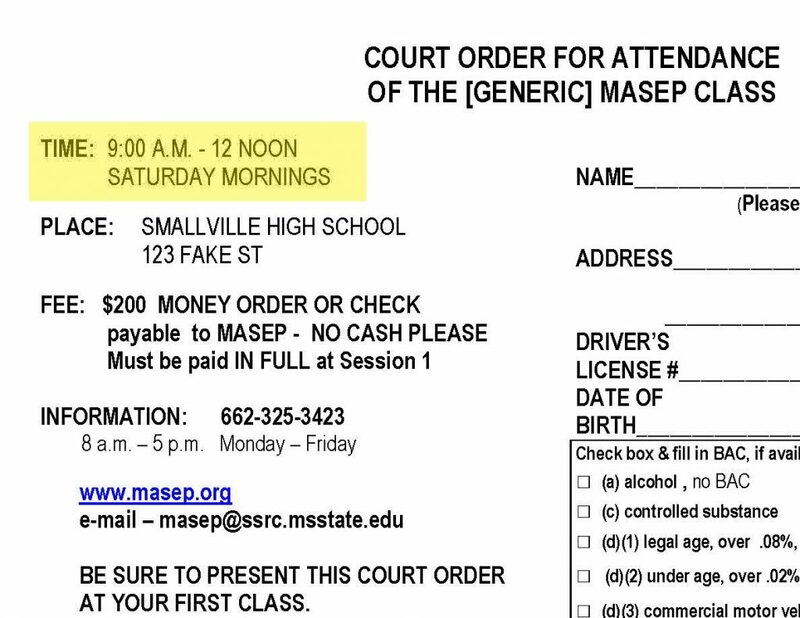 If the individual is licensed with Mississippi and received the 1st offense DUI in Mississippi, he/she must attend MASEP. 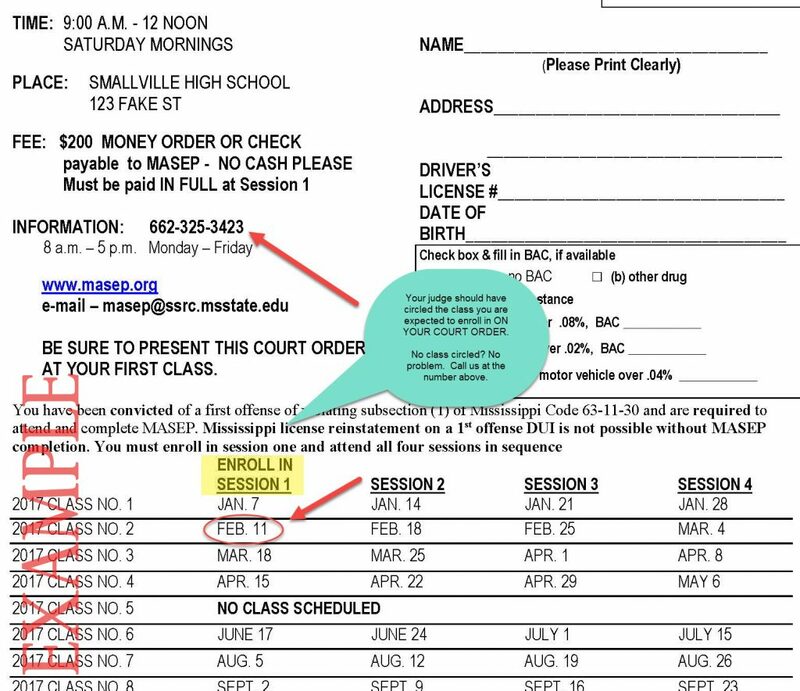 If the individual is licensed with Mississippi and received the DUI in another state, he/she must send a copy of his/her program completion certificate to MASEP. The Operations Coordinator will determine if the program attended is a comparable program to MASEP and will approve the out of state program in place of MASEP if it is. We strongly suggest that you also send a copy of your completion certificate to the court that handled your case. What must I do if I am licensed with another state and I am ordered to MASEP? The individual must contact the licensing agency in the state he/she is licensed with and verify what is needed in order to reinstate his/her license. What must I do when I complete MASEP and I am licensed in another state? The individual must contact the licensing agency of the state in which he/she is licensed. Can I take MASEP if I got a DUI in another state but live in Mississippi? Yes. The individual must mail, fax, or email a letter of request to MASEP along with the supporting documentation of the DUI charges. He/she must contact the state where he/she received the DUI and verify all the requirements needed to reinstate his/her license. Once the individual has completed MASEP, he/she must mail a copy of his/her certificate to the state where he/she received the DUI. There is a $50 out of state processing fee that must be paid. How do I contact the Mississippi Highway Patrol? You can reach the MSHP at 601-987-1224. If you have any more questions call us at 662-325-3423 or email us at masep@ssrc.msstate.edu.